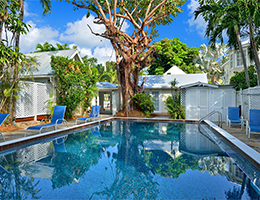 If you’re craving a Key West beach accommodation with a bone fide front-line view to the sea, you know they’re not easy to come by. 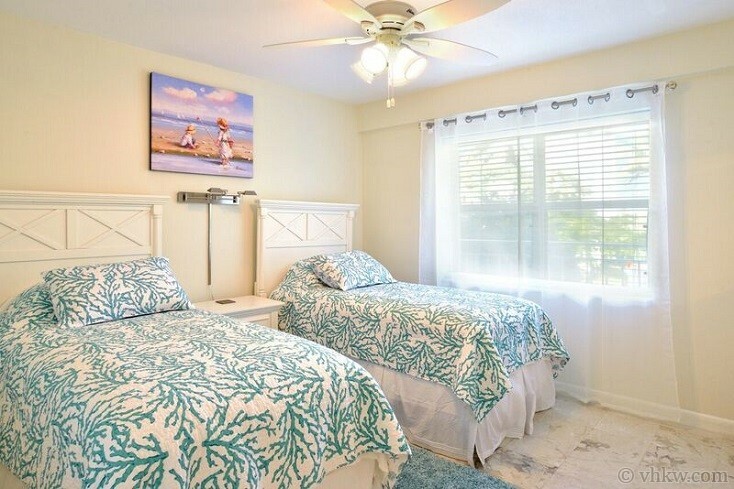 But in this pretty vacation rental condominium, By The Beautiful Sea, you can instantly gratify this need for sensational vistas from your own vacation rental terrace right across the street from the beach. 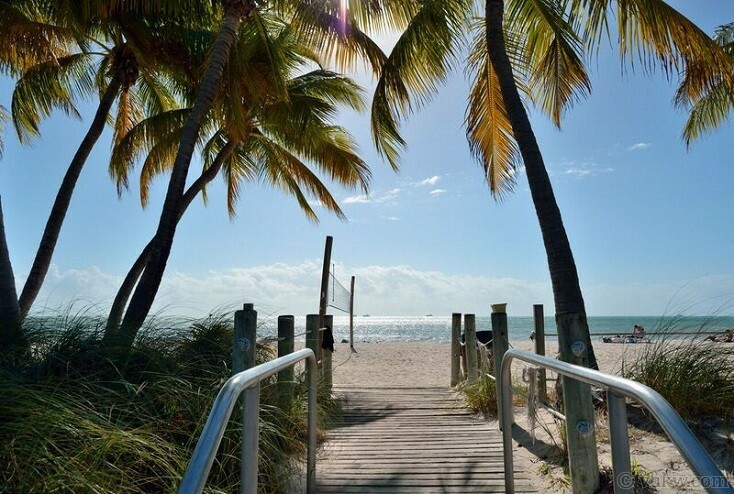 Make your first order of the day to breathe in the fresh ocean breezes with a walk along the beach and fulfill the desire to dig those toes into warm white sand . 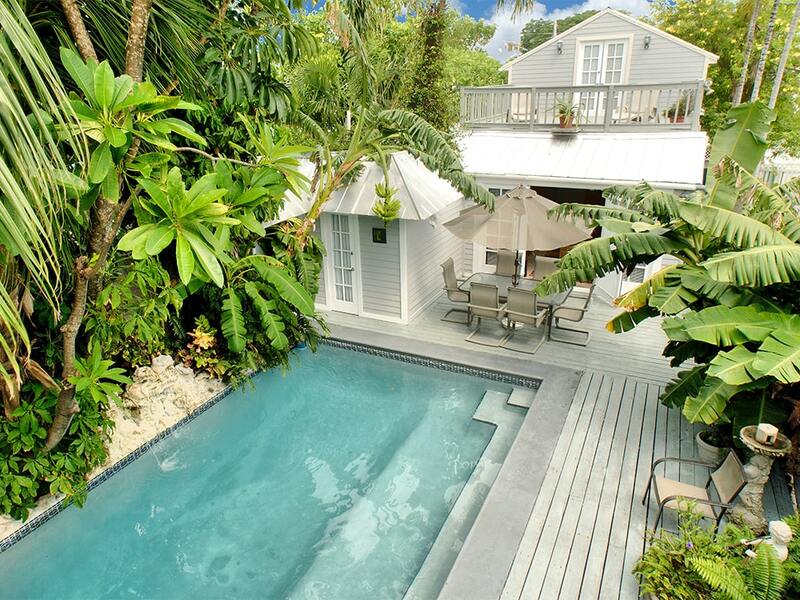 . . for after all your front yard is the Atlantic Ocean. Your ‘back yard’ view is not bad either. 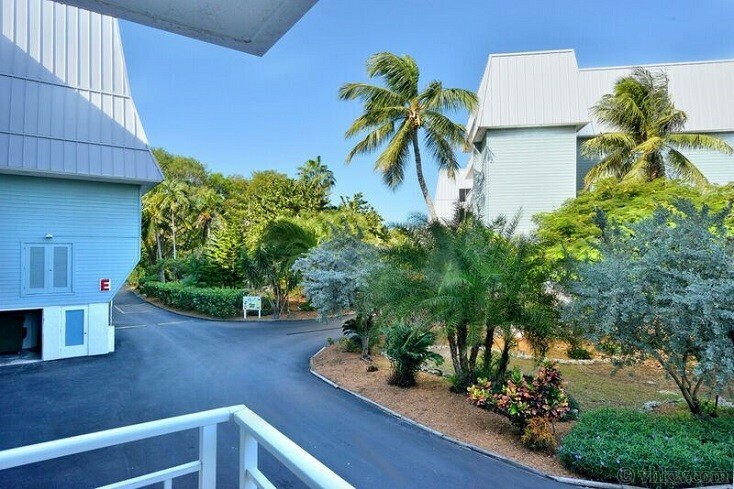 The entrance for this property connects with a second level walkway of the building, and offers views of beautiful tropical park-like landscaping. A short stroll from the condominium through the landscaped setting, leads to the large free form swimming pool and Jacuzzi. 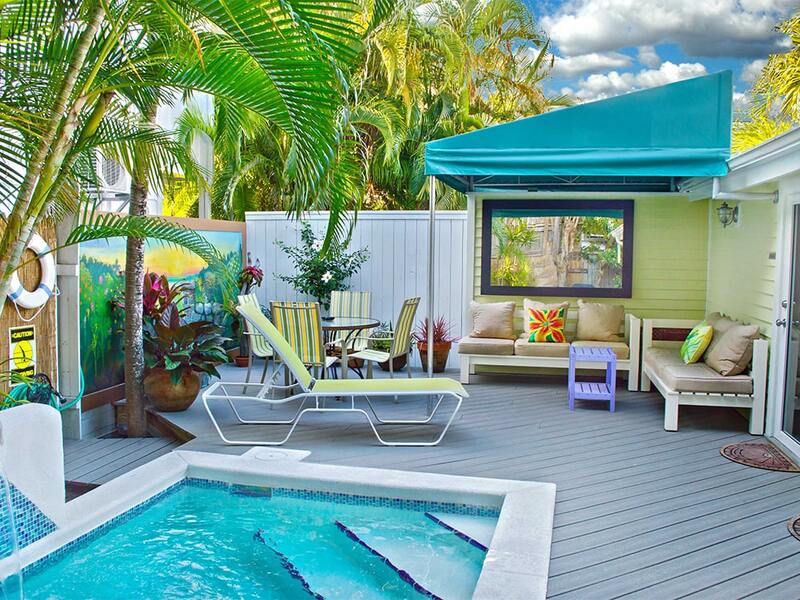 A major decision each day could be whether to enjoy the sun at the beach or pool side. And when it's time to go dining, shopping, or enjoying the nightlife, Old Town is close by and an easy bike ride away. Ahhhh . . . life in paradise is good. 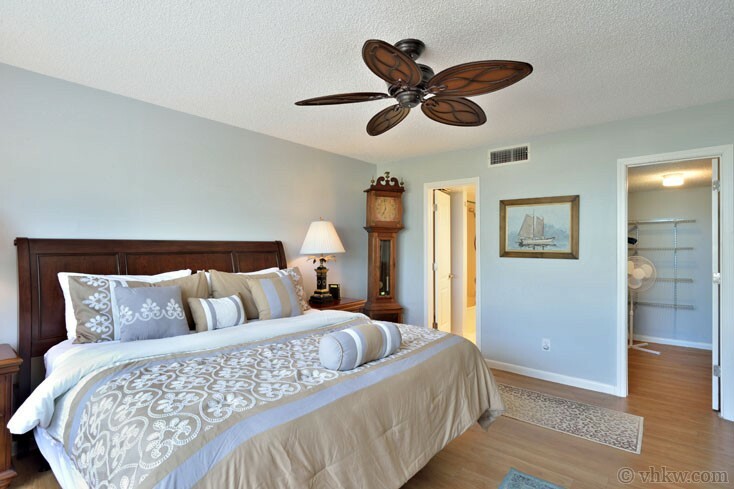 The interior layout of this property was designed to maximize the opportunity to take in the ocean view from the living room and dining area, as well as the master bedroom. Sliding glass doors off the living room, lead to a private ocean view terrace. 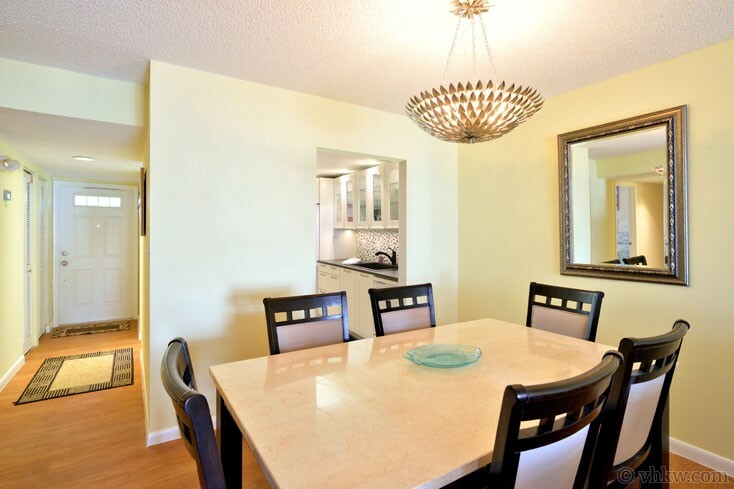 The kitchen adjoins the dining room through a pass through door, creating a floor plan that makes it easy for entertaining the family or a group of friends. 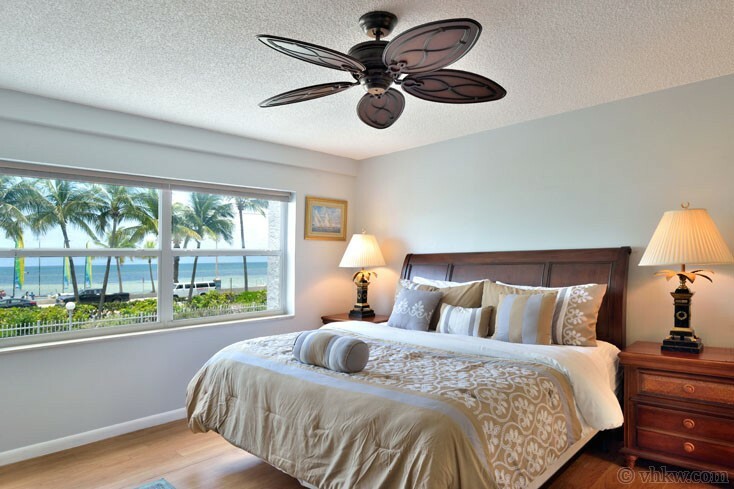 The layout of the bedrooms is ideal for a family or three couples. You’ll need to flip a coin for the enviable master suite that has the ocean view, plus a door that leads directly to the sea-side balcony. 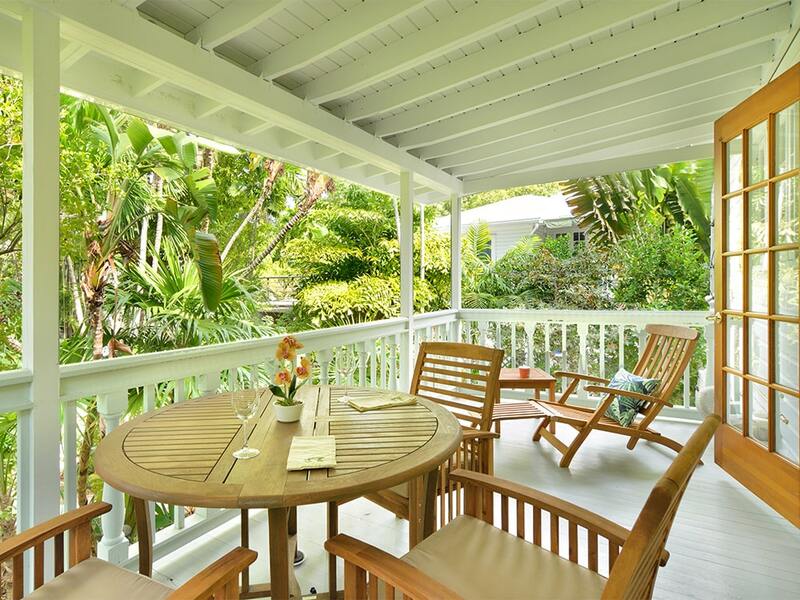 Furnishings are tropical elegant with a honey-colored wood-and-wicker king size bed and romantic free-standing grandfather clock to remind you that it’s 5 o’clock somewhere. Another nice feature of the master bedroom is a walk-in closet. 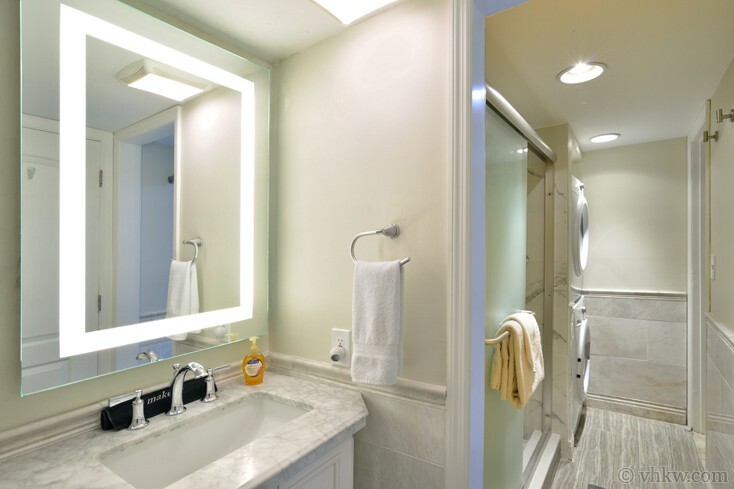 Next to this closet, the master bath provides a long vanity with two sinks, tiled floor, and bath-tub with in-tub shower. The other two bedrooms and second bathroom, are on the opposite side of the condominium, down a short hallway, just off the great-room. Immediately off the hall to the right is a bedroom with two twin beds, which can be made up as a king size bed upon request. Nicely decorated with white cottage furnishings, there is also plenty of daylight that streams in through a nice size window. 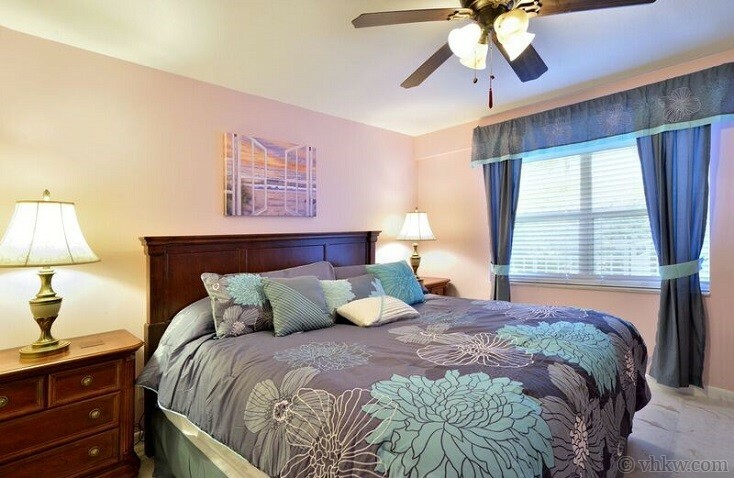 Directly at the end of the hallway is the third bedroom with king size bed. Handsome honey-colored wooden furnishings fill the room in nice contrast with the coral colored walls. A window on one wall invites in the natural light. The second full bathroom, with standing shower and glass door, is situated off the hallway, easily accessed by both the second and third bedrooms. 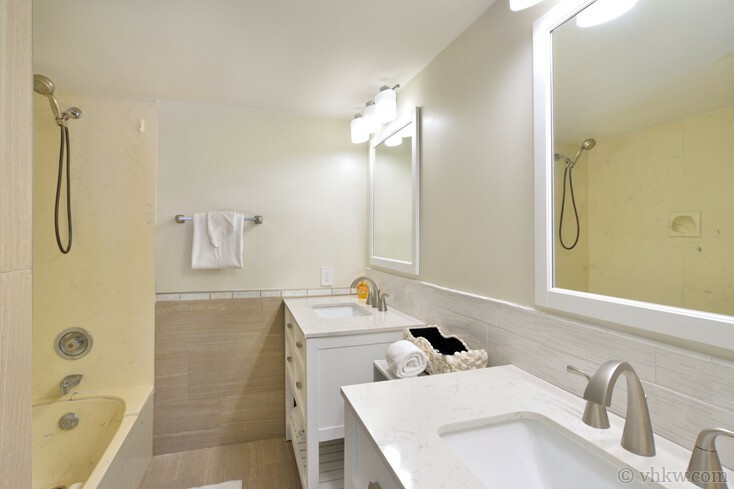 This bathroom also conveniently houses the washer/dryer, a welcome feature for a beach house, where you can come in and drop your towels and wet bathing suits. 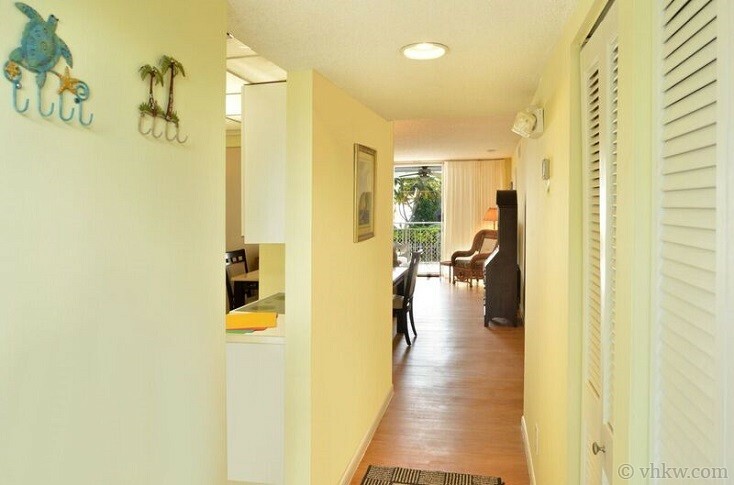 A notable layout feature of this property is that it's an end unit in the condominium building, making it one of the more desirable locations in the complex as you only have neighbors on one side. It is located on the first floor, but elevated second level, since the covered parking is directly below. This design provides a wonderful view of the ocean. The entrance to the unit can be reached by stairs or elevator. 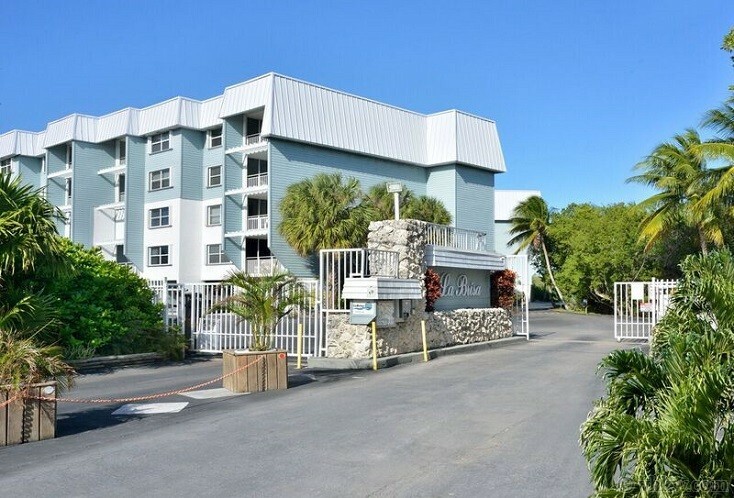 There is designated covered parking, and the condominium complex is gated and secured with an electronic key entrance. 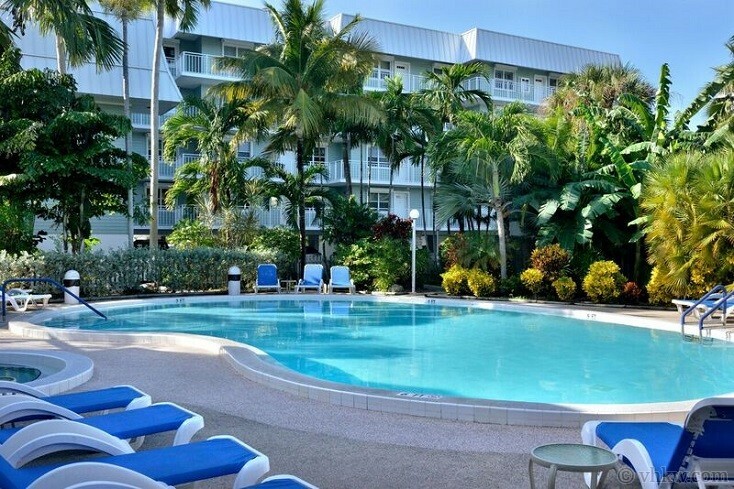 Amenities: Located in a beach condominium complex across the street from Key West Smathers’ Beach. Private balcony with front-line view to the sea. Balcony access from great-room and master suite. 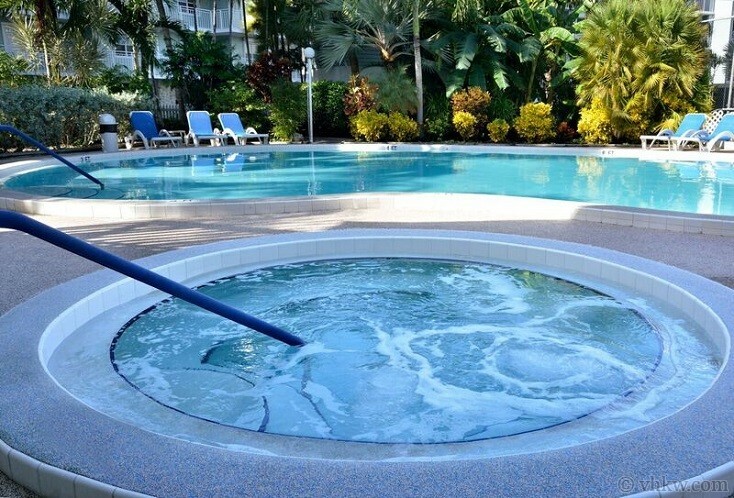 Resort style heated swimming pool, hot tub, separate men and women saunas and changing rooms near pool for guest use only. 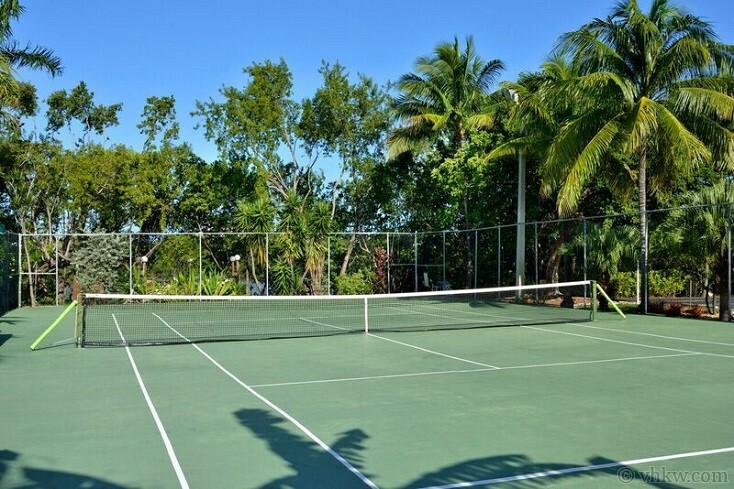 Tennis courts, propane BBQ grills on the grounds. Fully equipped kitchen, central A/C, Wi-Fi, cable TV and DVD, stereo, washer / dryer. Linens and towels are provided. Maid service can be scheduled. 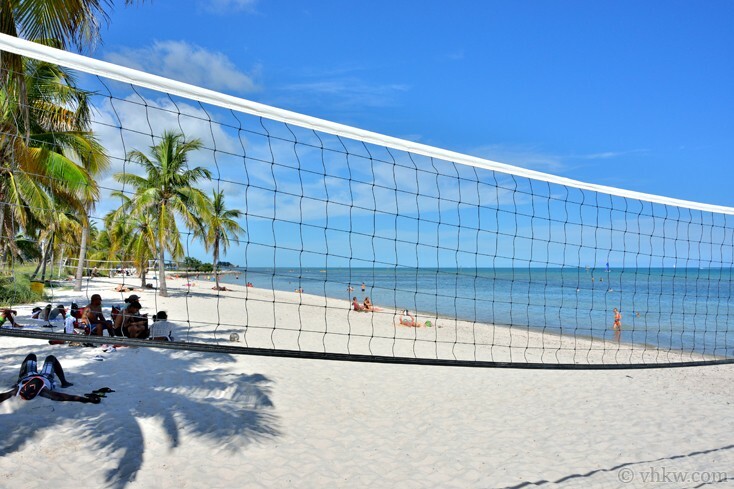 Activities: Everything beach! 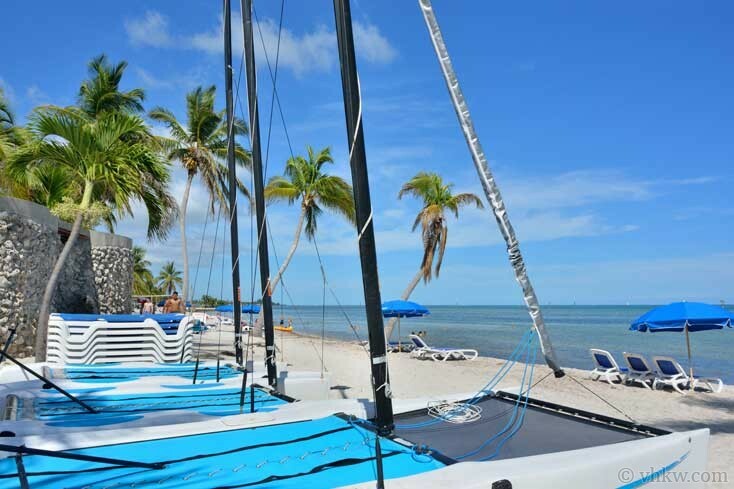 Sunning, swimming, catamaran rentals, volleyball, beach food trucks. Easy walk to the White Street Pier, Salute Restaurant for dining on the beach, ocean front children's playground, historic garden club, nature preserve, much more. 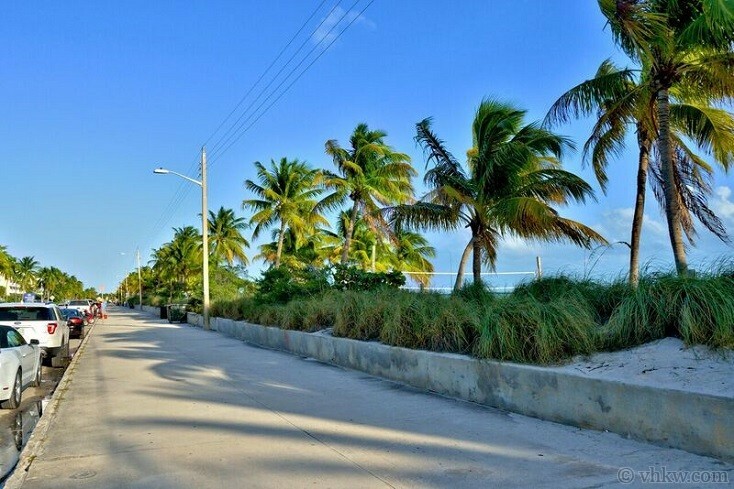 A bike / walking path winds along the ocean and leads you to the heart of Old Town Key West where you find restaurants, nightlife, museums, everything Key West has to offer. 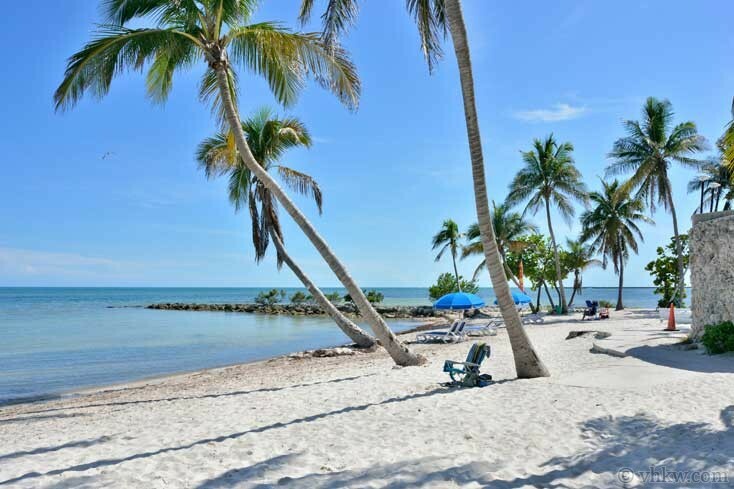 Area: This area of Key West is often referred to as the beachside neighborhood due to the close proximity to the southern shore of the island. This part of the island feels like a beach town neighborhood with light ocean breezes, and it's not unusual to see folks walking or biking on the bike path in their bathing suits with towel and cooler under arm. 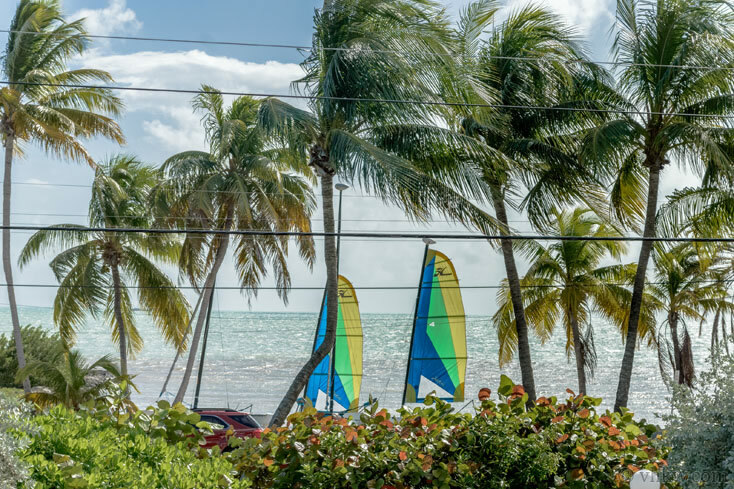 A paved biking and walking path stretches along the southern shore dotted with parks and food and water sport concessions making it easy and interesting to stroll or bike. There is a pre-Civil War Fort along the waterfront, West Martello near Higgs Beach that now houses the Key West Garden Club. Parking: Designated covered parking for one vehicle. One additional vehicle may park in the adjoining lot. All vehicles parked must display parking passes issued by the condominium. Scooter parking allowed. Bicycle racks near elevator. No boats, RV's, Jet ski's or trailers of any kind are allowed in the parking area. Restrictions: No smoking. 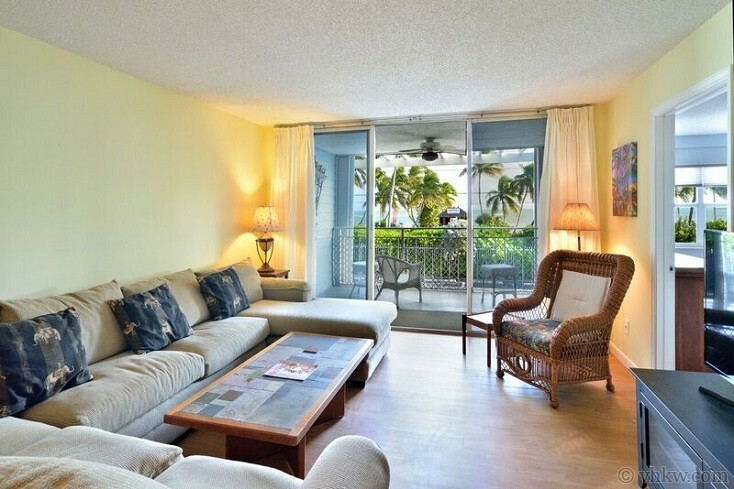 This condominium is offered as a vacation rental in a preferred beachfront condominium in Key West. Pets are not allowed. We do not accept guests less than 25 years of age unless accompanied by a family group or guardian. No boat, trailer (bike or boat), jet ski, or RV parking. 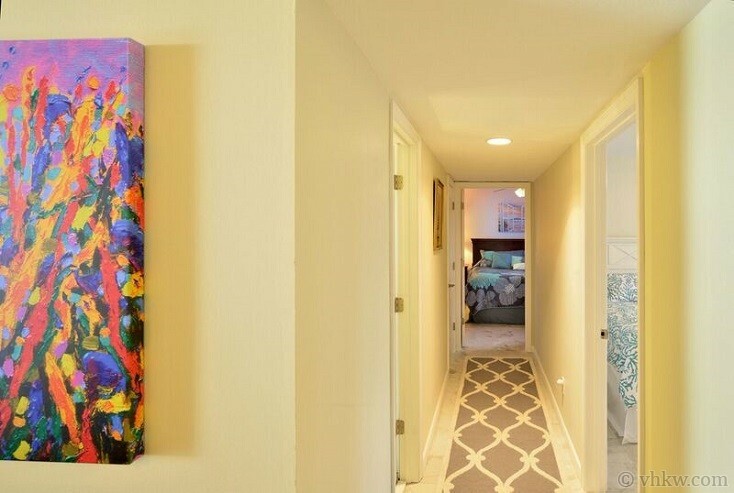 Guests must agree to abide by condominium regulations. Apr 20, 2019 - May 26, 2019 $2775 $525 4 night min. or 3 night min. 60 days prior to arrival. May 27, 2019 - Jun 14, 2019 $2350 $480 4 night min. or 3 night min. 60 days prior to arrival. Aug 9, 2019 - Oct 19, 2019 $2350 $480 4 night min. or 3 night min. 60 days prior to arrival. 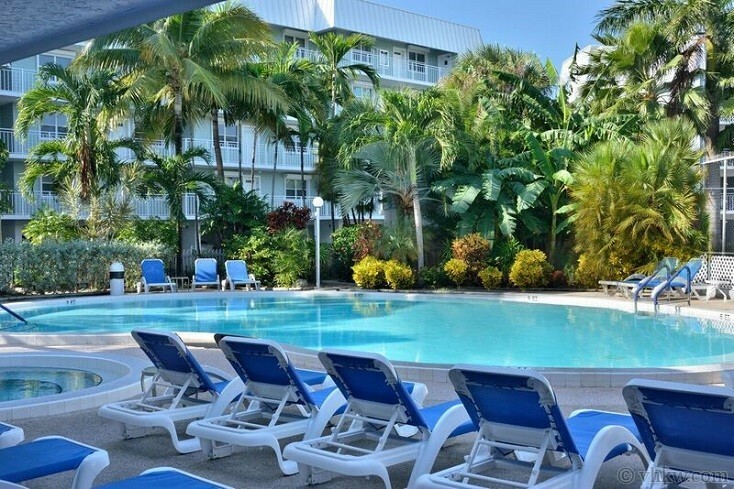 Nov 11, 2019 - Nov 22, 2019 $2350 $480 4 night min. or 3 night min. 60 days prior to arrival. Jan 4, 2020 - Jan 10, 2020 $3025 $600 4 night min. or 3 night min. 60 days prior to arrival. Jan 11, 2020 - Jan 17, 2020 $3025 $600 4 night min. or 3 night min. 60 days prior to arrival. Jan 18, 2020 - Jan 24, 2020 $3025 $600 4 night min. or 3 night min. 60 days prior to arrival. Apr 18, 2020 - May 24, 2020 $2775 $525 4 night min. or 3 night min. 60 days prior to arrival. May 25, 2020 - Jun 12, 2020 $2350 $480 4 night min. or 3 night min. 60 days prior to arrival. Aug 8, 2020 - Oct 22, 2020 $2350 $480 4 night min. or 3 night min. 60 days prior to arrival. Nov 16, 2020 - Nov 19, 2020 $2350 $480 4 night min. or 3 night min. 60 days prior to arrival. Thanks, VHKW for helping our family have a wonderful vacation! We loved the property and working with your team was very easy! I appreciate all the quick responses to our questions. We will defiantly book with VHKW in the future! Home was clean and comfortable. The view was beautiful. The grounds were well maintained. We had a wonderful time and plan on coming back. The service from the office was excellent! Very efficient in communication with me . There were a few minor details about our rental property and I communicated them to office and they were interested in the details of my feedback to benefit future renters. Beautiful location! Plenty roomy for 3 families. Appreciated the free parking spaces. Pickup and return of keys/gate access passes could be a bit more streamlined. Loved our stay! We stayed at By The Beautiful Sea. 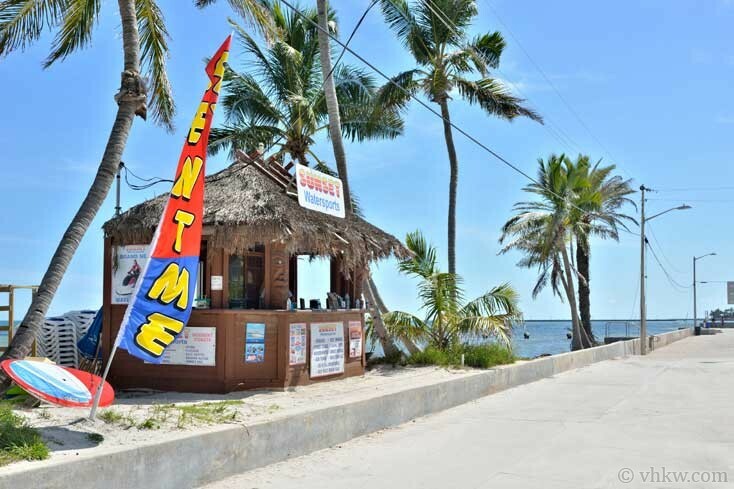 It is located across from Smathers Beach. We had a great view and you just crossed the street to get to the beach. The condo was very well taken care of. We would stay there again. 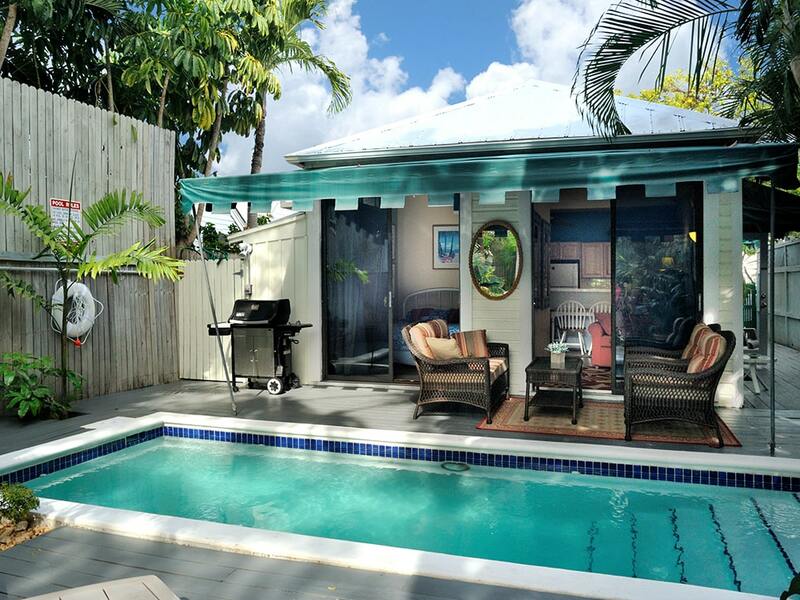 Renting through Vacation Homes of Key West was very easy. We LOVED our stay at La Brisa! We felt very safe with the gated entry and coded elevator. The pool was amazing as was the hot tub. Everything was SUPER clean! 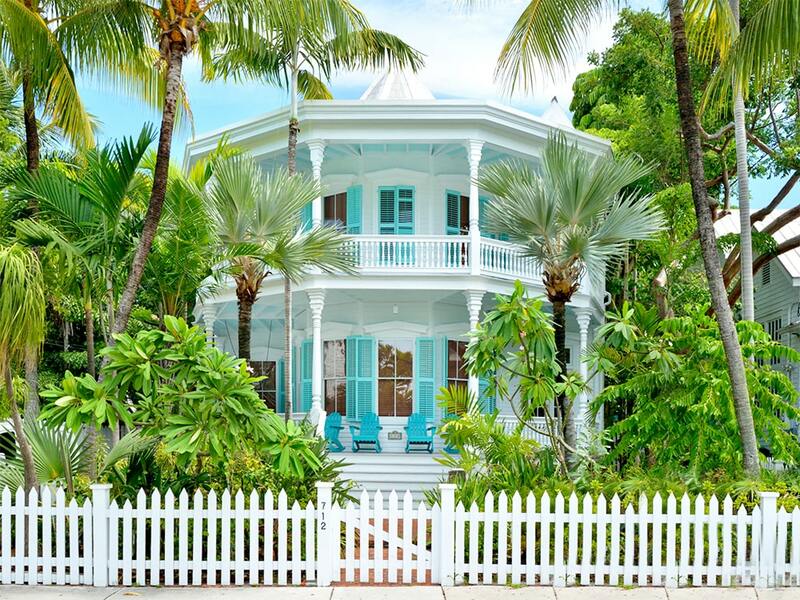 There were always people working around the property maintaining things and keeping it looking amazing! The condo itself was better than we even imagined! 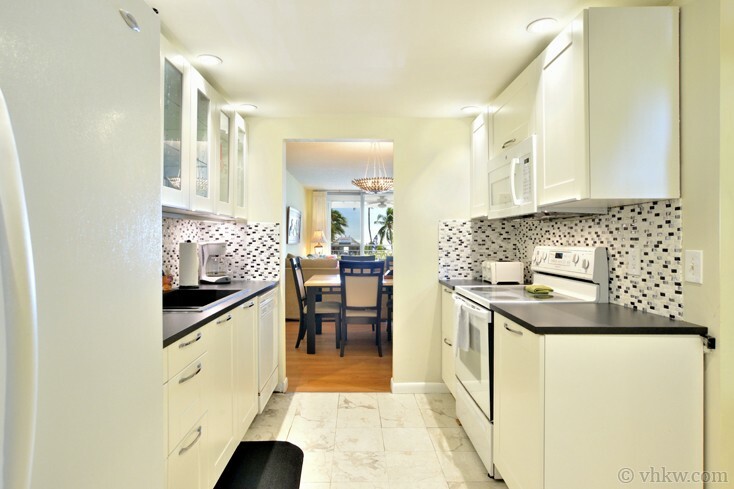 I loved the tiled floors and the kitchen was updated and had EVERYTHING we needed. The whole place was very clean and comfortable. There were plenty of towels and even pool towels for us when we got there! The beds were comfy and we enjoyed having a TV in each bedroom as well. There was plenty of space for our family of six. The best part was the view! 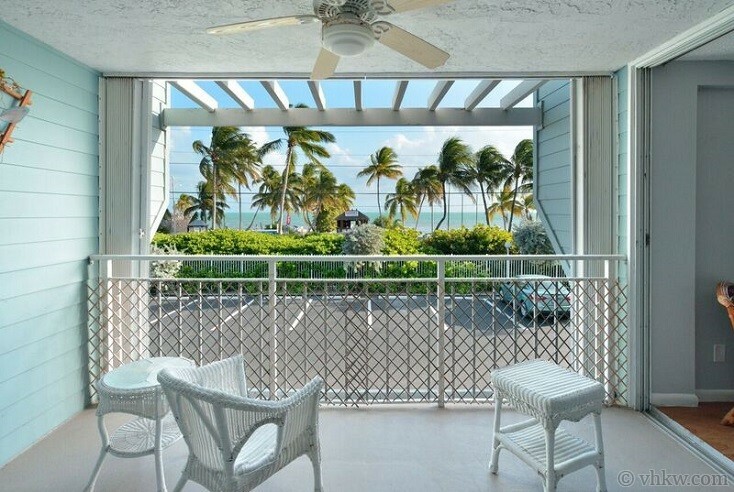 We sat on the balcony every day and just enjoyed the ocean breeze and the palm trees. There was plenty of beach chairs, Umbrella, toys, etc. in the storage closet. We spent lots of time sitting in those chairs on the beach which is literally right across the way. The elevator was super handy for unloading the car with luggage or groceries and perfect for my daughter who is in a wheelchair. There is 100% chance we will be back! We had a wonderful time. The condo was perfect. No complaints!! 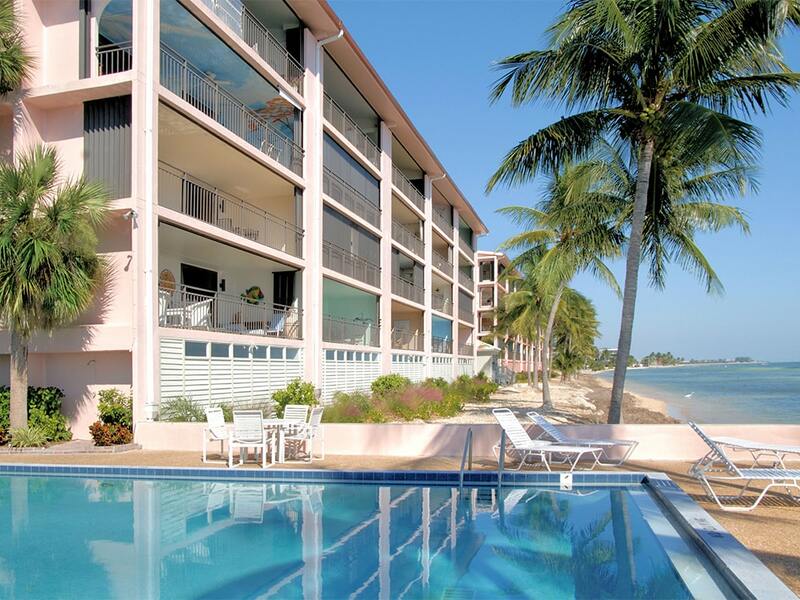 The condo on the south side of Key West, right across the street from the beach. It is a gated community with a nice pool. 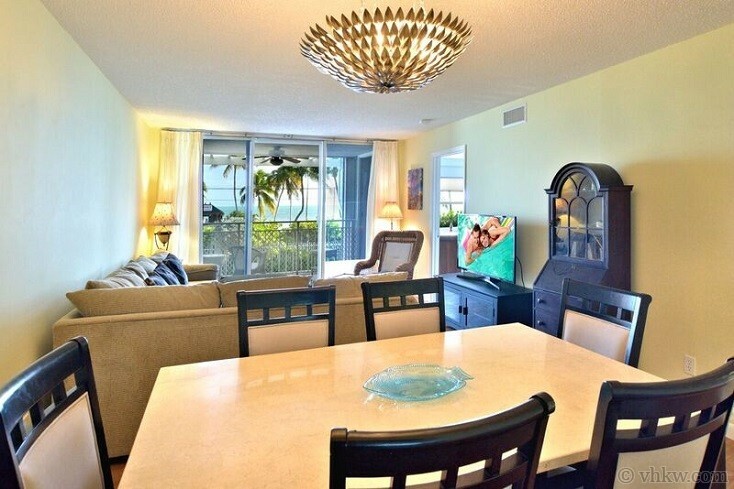 Condo is spacious, well maintained, with all need need for family and friends. Across the street is a nice calm water beach. Its not like beaches I'm used to, but very safe fir kids to go play in the water and snorkel. There is some sea grass build up but it seems natural and there are fish swimming all over. It is a short drive to the main part of town bit worth it having the beach right across the street. Ultra smooth process. Everything was as promised. Delightful time. Our condo was beautiful and in a great location! 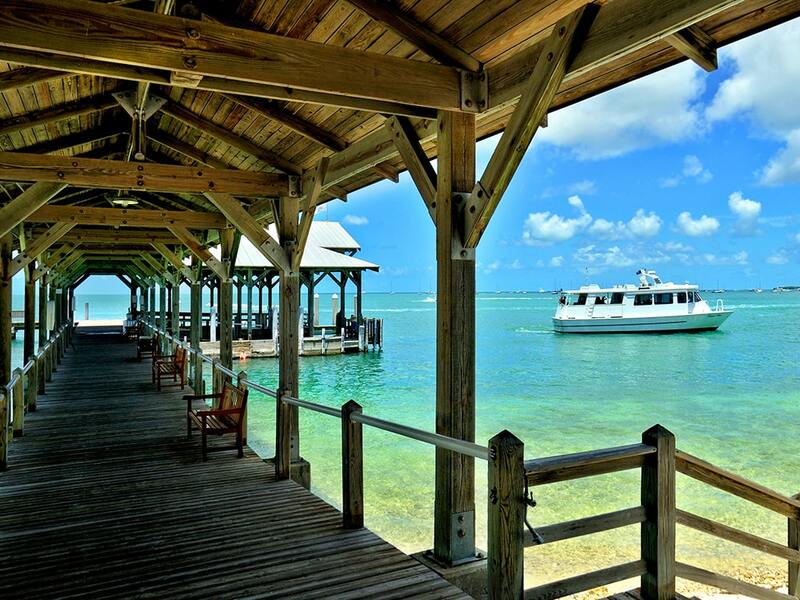 Quiet and right across from Smathers beach. We couldn't have asked for anything more.